It is such a treat to have friends like that - to have people to compare notes with and discover new destinations. Thanks to their recommendations Tallinn never ceases to surprise! Cook the pasta according to the instructions on the package. Fry the onion, finely chopped chilli and garlic in some butter. When they've softened a bit, add the tomato paste and vodka along with the lobster fond and cream. Cook for a bit longer and add dill. Add prawns and cook for a couple of more minutes until they're cooked through. Season and serve. Be careful with salt as there's some in the lobster fond and roe. 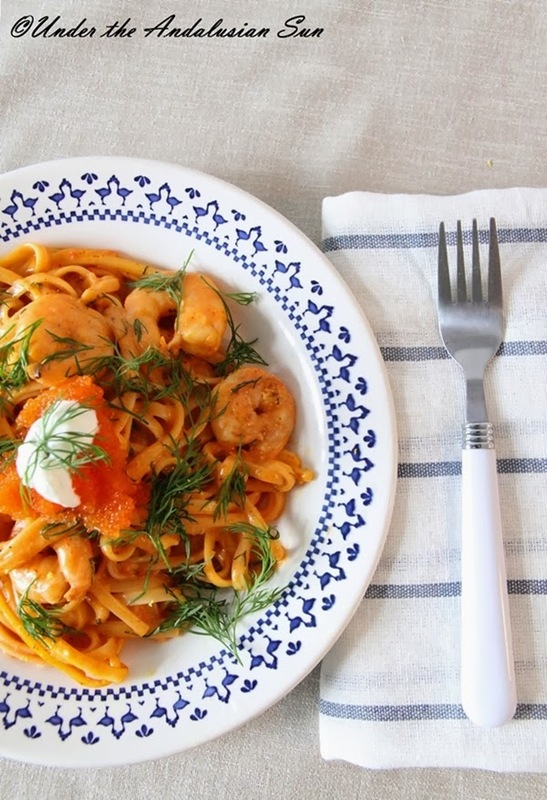 Fold the pasta into the sauce and serve with a dollop of sour cream and roe.